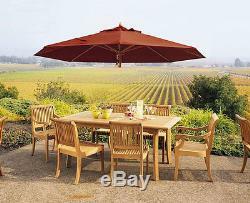 Beautiful 7 piece 100% teak dining patio & pool set 60 Rectangle Table, 4 Armless & 2 Arm Chairs. OUR PRODUCTS ARE MADE FROM "A" GRADE TEAK WOOD AND WE USE QUALITY WOOD FOR PRODUCTION SO WE DON'T LACQUER LIKE OTHERS TO HIDE THE POOR QUALITY OF THE WOOD. TEAK WOOD LOOKS BEST IN ITS NATURAL STATE. There is a 2 hole for umbrella, lid provided to cover hole if no umbrella used. The teakwood has been KILN DRY before the furniture was made. Stainless Steel hardware used for durability. 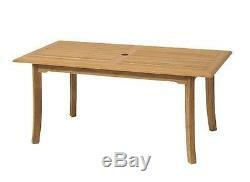 Table Dimension: 60" Length, 36" Width, 30 Height. Armless Chair Dimension: 17¼" W, 23" D, 35 H. Arm Chair Dimension: 23¼" W, 23" D, 35 H. Assembly: Very little assembly (hardware and instructions included). Generously stuffed with foam and/or fiberfill, our cushions are covered with a sturdy, canvaslike fabric called Sunbrella®, which resists damage from mildew and UV radiation. Cushions may be selected from more than 300 fabric choices from Sunbrella®. All the covers unzip for washing; spot clean. Cover or take indoors during inclement weather. Prior authorization required for return item. Visit our profile at Teak Warehouse. 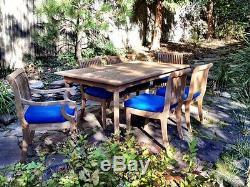 The item "7 PC TEAK DINING SET GARDEN OUTDOOR PATIO FURNITURE GIVA DECK (60 RECT TABLE)" is in sale since Friday, April 24, 2015. This item is in the category "Home & Garden\Yard, Garden & Outdoor Living\Patio & Garden Furniture\Patio & Garden Furniture Sets". The seller is "superteakdeals" and is located in USA. This item can be shipped to United States, Canada.